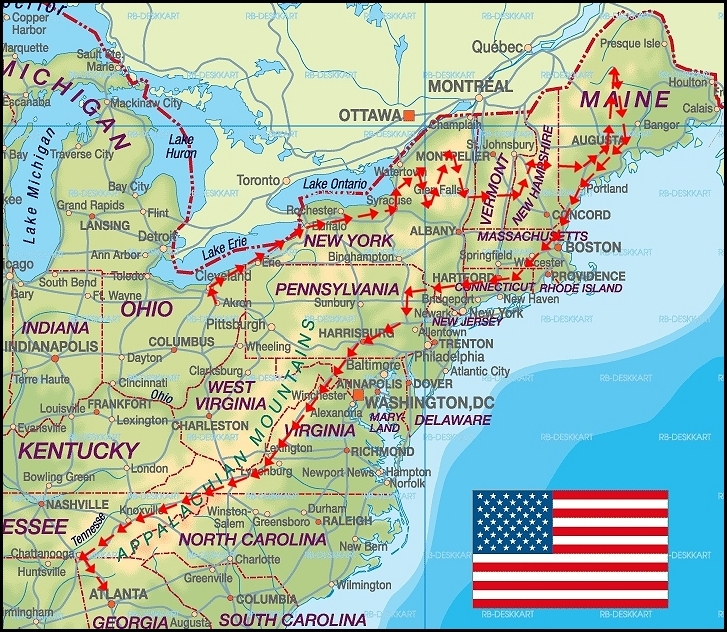 "Self, you've never been to the Northeast section of the US and that's the only part of this country you haven't seen yet, aside from Alaska and Hawaii. Since you're so dern close, and you don't have a job to force you back to Georgia, why not take advantage of this opportunity and go for a ride-about." So I called my wife and threw the idea by her and, sweet little gal that she is, she said, "I think you ought to go for it." So I did! After the wedding I took a couple of days to visit two of my Aunts, bid my cousin a fond farewell, and off I went. I won't go into all the details of my adventure other than to say I saw some fantastically beautiful country, especially Vermont and New Hampshire, and had a great time. Being the train lover that I am, I found a few railroad museums and excursions to visit. This section of my site is dedicated to those museums I visited and the excursions I rode. Click on the "Page 2" link below to see some of the photos I took. The map gives you a rough idea of the path I took. Just follow the red arrows. Note: Please understand, I'm not the best phptographer around.